I have now completed The Week of Fixing Everything. Here - ta-dah! - are the results. 1. Carseat straps that needed adjusted: DONE! It took ten minutes total including the time to nag my son to do it. 2. Dog hair in the car: GONE! This might have taken five minutes total. Now I can invite friends to ride in my car without shame. 3. Shabby clothes: TWO NEW DRESSES PURCHASED ONLINE; one has been dropped off for alteration at a friend's seamstress. I also did the easiest and most cost-effective shopping of all: shopping in my own closet. It turns out I do have plenty of non-shabby clothes; I just prefer to wear the same shabby ones over and over again. So I'm planning to force myself to branch out. 4. Inadequate will: ESTATE PLANNING CONSULTATION SESSION ACCOMPLISHED! The new documents will be ready for my signature next week. 5. Family member in need of medical checkup: HEARTFELT PLEAS FINALLY WORKED! APPOINTMENT HAS TRANSPIRED! But many future appointments are going to be needed. Still, I can't tell you how extremely relieved I am that this is happening. 6. Children's literature article revisions overdue: HARDLY ANY PROGRESS MADE (insert frowny face emoticon here). I did re-read my article and fell in love with it all over again; then I re-read the reviewers' comments and felt despair all over again. 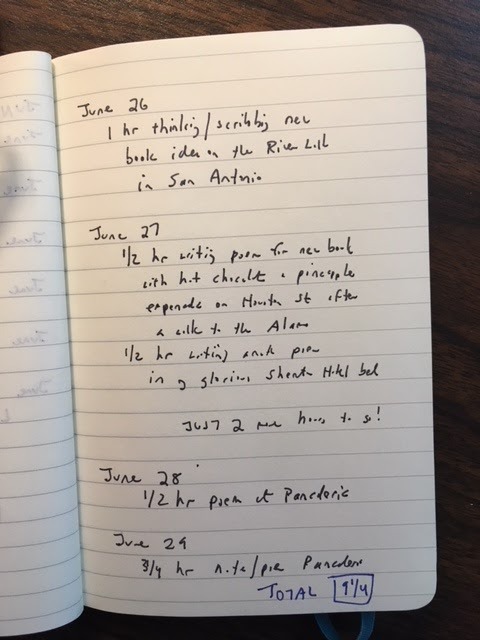 But I'm ready to accept that I can't possibly do everything they want me to do, so I'll make a list of ten things I'm willing and able to do, do them, and hope for the best. I can't do this until later in August. 7. Revisions on a children's book manuscript desperately needed before I can even show it to other writer friends for their review: AN HOUR A DAY (well, two hours on some days) DID THE TRICK! I emailed the vastly improved draft off to five writer friends ten minutes ago. 8. Guilt for not composting: CONTAINER IS ON COUNTER! COMPOSTABLE BAGS HAVE BEEN PURCHASED! I AM COMPOSTING MOST MERRILY - but newly aware of, and newly appalled by, how much food we waste. But now we can start doing better. 9. Desire to lose two pounds: FAILURE! Oh, well. 11. Frazzled time with grandchildren: TEN-YEAR-OLD MOTHER'S HELPER HIRED FOR ONE DAY NEXT WEEK, with backup sitters in view. 12. Chaotic pantry: MY HUGEST TRIUMPH! In two hours, it was sooooooo much tidier, cleaner, and better organized. The photo doesn't do justice to its splendor, but note how you can actually walk into it without tripping over boxes of Cheeze-Its. 1. It was a wonderful idea that led overall to wonderful results. Each thing fixed built momentum to fix other things. I was a crazed woman on a mission! This was a happy and satisfying week for me. 2. The easiest things to fix are the "one and done" items (or, at least, "one and done for now"): little pesky chores that take hardly any time and, once done, stay done for a reasonable length of time. This should have been obvious to me, I suppose, and yet I procrastinated disgracefully on these piddly tasks until I decided to tackle them en masse this week. 3. The other particularly satisfying category of fix-it items are the "just take the first step" items: in my case, make the estate planning appointment, make the family member's medical appointment, start household composting. For composting, the important thing was to overcome groundless resistance and to develop what I'm sure will be a self-sustaining habit. For estate planning and medical appointments, the important thing was to face things that are depressing to face - one's own mortality, a family member's declining health - but will be much worse if not faced. 5. The biggest casualty of the week was energy diverted from my writing projects to fixing everything else in my life. Writing is hard, period. Any easier task can beckon me away from it, especially if the easier task yields instantaneous rapture (e.g., MY PANTRY!!!). This is why I can't make every single week of my life The Week of Fixing Everything. That said, there was really no way I could finish book revisions AND article revisions in a single week, and in the end I think I made more progress on the book revisions spurred on by fix-everything mania. Bottom line conclusion: As a once-in-a-while undertaking (perhaps quarterly? ), I highly recommend giving yourself the gift of A Week of Fixing Everything. Here's my hard-won boast: I am extremely good at accepting what I cannot change. "Oh, well," I say with a sigh and a rueful grin. This is my standard response to the long list of things that are sub-par in my existence. But of late I've been struck by this new meme I'm encountering: "I'm tired of accepting what I cannot change. I'm going to start changing what I cannot accept." Ooh! Maybe there are some troubling aspects of my life that I CAN change? And if so, maybe I should actually change them? This prospect, though, is somewhat daunting. So, of course, I sat down and made a list of all the problems in my life, large and small, and how I might possibly do something to solve them. And then I decided to try to SOLVE THEM ALL IN ONE WEEK! Why not just face what has to be faced and take care of them all in one fell swoop? So this last week in July, starting TODAY, is going to be the week of fixing everything. Here is my list of current woes and what I plan to do about them this week. 1. It's an ordeal getting my granddaughters in and out of their carseats because the straps need adjusting. Fix: ADJUST THEM! 2. There is dog hair all over the front passenger seat of the car from taking Tanky to the vet. Fix: VACUUM IT! PUT AN OLD SHEET IN THE CAR TO AVOID THIS PROBLEM IN THE FUTURE! 3. My clothes, all bought at Goodwill, are getting too shabby even for me. Fix: BUY SOME NEW ONES! 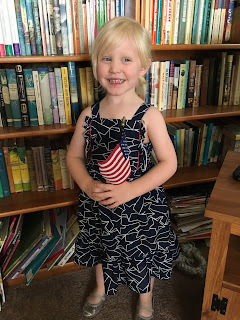 When I was teaching in Utah last month, I admired a student's dress and asked if I might inquire where she had purchased it. So now I have a new favorite dress source: Mikarose, a Utah company specializing in "modest" clothes. I know it will cause a sensation in church when I arrive wearing something different from the same half a dozen things I've worn for the past half a dozen years. 4. I wake up in the middle of the night worried that my will is woefully inadequate in a way that would be disastrous for certain family members if I died tomorrow. Fix: MAKE AN APPOINTMENT FOR A FREE 90-MINUTE CONSULTATION WITH AN ESTATE PLANNER! 5. Another family member's health is declining rapidly; this person needs to have a years-overdue doctor's appointment to see what might possibly be done. This one definitely seems to fall in the category of "things I cannot change" because if there is anything in this world that is true, it is that you can't change other people and make them do something they don't want to do. Or IS that true? Fix: TRY HARDER TO COAX AND CAJOLE AND COERCE AND COMPEL! 6. I feel stressed every day about a children's literature academic article which needs to be revised-and-resubmitted from the reviews I received from the journal many months ago. Fix: JUST SIT DOWN AND DO IT! 7. I feel stressed as well about book revisions that feel especially overwhelming. Fix: JUST SIT DOWN AND DO THEM! 8. I am consumed with guilt that everyone else in Boulder except for me composts their food waste, but it just seems so messy and complicated. 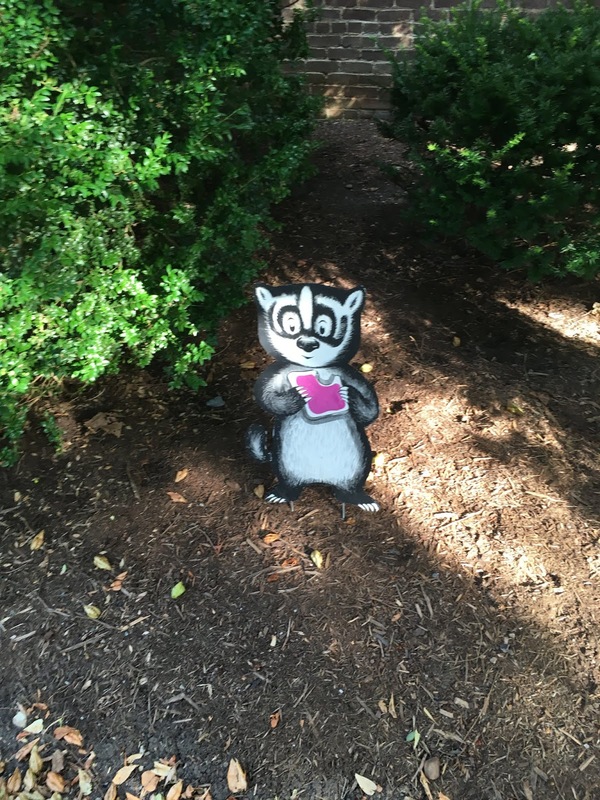 Fix: GET COMPOSTABLE TRASH BAGS! GET A CONTAINER FOR FOOD SCRAPS TO KEEP ON THE COUNTER! BY THE END OF THE WEEK IT WILL BECOME SECOND NATURE TO DO THIS! 9. I would like to lose two pounds to have my weight below a Certain Number on the scale. FIX: EAT LESS! NO MORE KEEBLER FUDGE STICKS FOR YOU, MISSY! 10. The meals in our house are awful, truly awful - lots of snacking, lots of carryout. FIX: GET OUT MY COOKBOOKS, PICK A FEW RECIPES, AND MAKE THEM! 11. I find myself frazzled at the end of each long day of caring for my granddaughters during their monthly ten-day visit. FIX: HIRE SOME TEN-YEAR-OLD "MOTHER'S HELPERS" TO COME FROM 3-5 EACH DAY! 12. 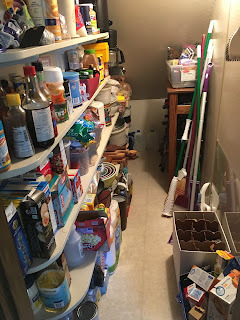 The pantry is a nightmare of disorganization where I can't find anything and end up buying lots of things I already have, thus adding to the chaos. FIX: CLEAN IT! I do believe it is possible to fix every single one of these things over the course of the next seven days, though maybe I'll have to choose between the article revisions or the book revisions. Still: even if I don't get all of these things done this week, even if I only get half of them done, how much better my life will be. . . .
Can the Joy of Time Away from Home Inspire Joy upon Returning? I am spending a blissful week at Hollins University in Roanoke, Virginia, where I taught in the Graduate Programs in Children's Literature for the six-week term last summer as well as for six weeks in the summer of 2014. I'm not here to teach this time, however. I'm here just because I couldn't bear to stay away. Our beloved founding director, Amanda Cockrell, is retiring after a quarter century in the position. My dear friend Lisa Rowe Fraustino now takes the helm. I wanted to be part of the gala farewells to Amanda and to spend time with colleagues and former students returning for reunion week. So here I am. 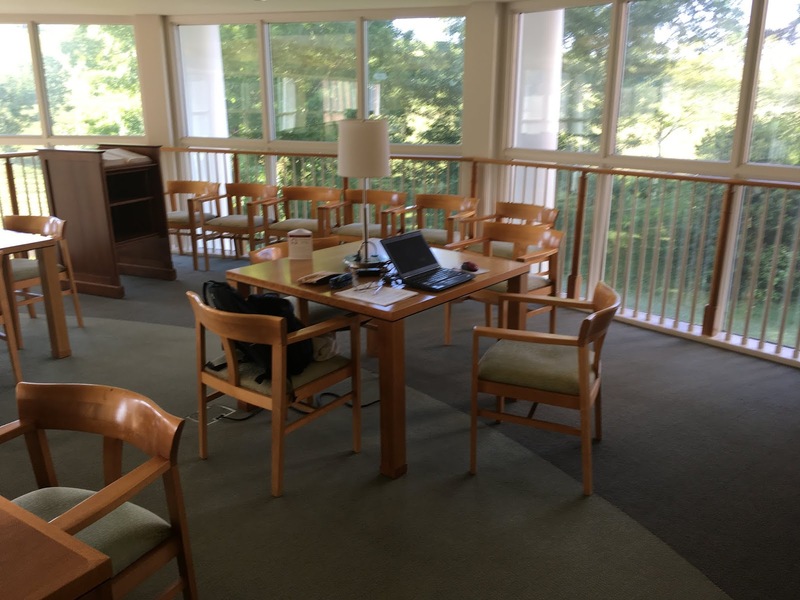 I'm writing this while sitting at "my table" in the Hollins library, looking out at a grassy hill rising toward the Blue Ridge Mountains. It is such a perfect place to work! So far since arriving on Monday evening, I've sat here and typed up minutes for last weekend's Church Council meeting, written a review of a scholarly article on child author Opal Whiteley, written comments to deliver on a philosophy paper on the ethics of using photographs as tools of moral persuasion for the Rocky Mountain Ethics Congress next month, and read part of Perry Nodelman's brilliant book The Hidden Adult that will help me revise and resubmit a children's literature paper of my own. Today I'm turning to creative work - revisions on my current chapter-book-in-progress (the one about the girl attending an after-school comic-book-making camp). I love work. I always have. And I especially love working at a beautiful table in a beautiful library on a beautiful campus in a beautiful city. Plus walking twice around the permimeter of that campus at sunrise. Plus eating scrumptious cafeteria breakfasts (how I love made-to-order omelettes, and hash-brown potatoes, and biscuits with butter and jam.). Plus attending luncheon talks on craft, and an inspirational talk last night by visiting author Guadalupe Garcia McCall. And a pool party Tuesday night, dinner party tonight, and Francelia Butler Conference all-day Saturday. I'm so happy here, and so productive here, too. Maybe I'm so happy partly because I'm so productive. And maybe I'm so happy and productive partly because I'm so intellectually and creatively stimulated. So now my question for myself is: can I find a way to be this happy and productive at home? At home I take a lovely walk each morning at 6 am with a dear friend and a faithful dog. So I already have that. At home I make myself breakfast - maybe I could go to a little extra effort to make a more lavish one? But maybe that's not worth it. At home I have lots of creative and intellectual friends - maybe I should make sure to have regularly scheduled breakfasts and lunches with them, or to find stimulating talks to attend together. Still, I do have all these delightful Hollins-y things already in my life. 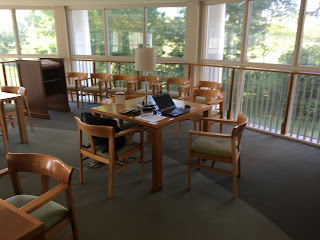 The main thing I lack is a place to work that is as inspiring as this table - so quiet, with so much room to spread out my books and papers, in a room so full of light, with a view so serene. I have an acceptable little office at home, with a desk I keep fairly uncluttered, and a view out into a tree where squirrels scamper and play. But . . . it isn't THIS quiet, and THIS beautiful, and THIS sacred a spot consecrated to doing the work of my heart. So I think I should give myself the pleasant challenge of trying to find one. The one thing I can't find a replacement for at home is the whimsical little children's literature characters, created by Hollins faculty member Ashley Wolff, which are hidden all around campus. As some of you know, my chief goal for 2018 is to have 10 hours of creative joy each month. I have strict standards for what counts as creative joy: it can't just be joy experienced doing something creative - too easy! It has to be joy experienced doing something creative with something EXTRA added: writing somewhere special, writing while eating something special, writing in the company of someone special, even just writing with a lit candle by my side, or a dollop of Cool Whip in my morning Swiss Miss hot chocolate. So far this year I've totaled: 14 hours of creative joy in January, 14 in February, 15 in March, a whopping 22 in April, 14 in May . . . but only 9 1/4 in June. My average is definitely greater than ten hours a month, but according to my self-imposed rules, I'm not allowed to stockpile creative joy hours in lush months as a safeguard against leaner ones. The goal is to make EVERY month a creatively joyous one. Those missing three-quarters of an hour of creative joy in June stand as a reproach to me. My hero, Victorian novelist Anthony Trollope, faithfully logged his pages written every day, entering "day by day, the number of pages I have written, so that if at any time I have slipped into idleness for a day or two, the record of that idleness has been there, staring me in the face, and demanding of me increased labour so that the deficiency might be supplied." He confesses that "a week passed with an insufficient number of pages has been a blister to my eye, and a month so disgraced would have been a sorrow to my heart." 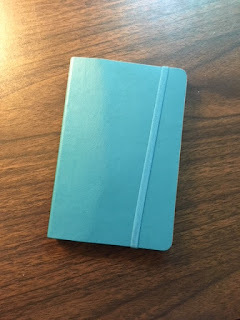 So now my little creative joy log stands as "a blister to my eye" and "a sorrow to my heart." 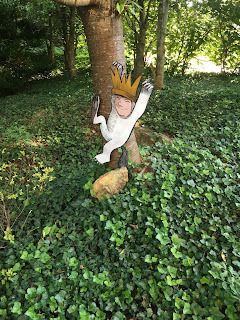 Next week will be nonstop creative joy, as I'm traveling to Roanoke to reconnect with colleagues, former students, and dear friends at the Graduate Program in Children's Literature at Hollins University. I'll write in their beautiful library. I'll write curled up in one of the soft blankets thoughtfully provided by the library against air conditioning chills. I'll write in a rocking chair on a veranda. I'll write, and write, and write, and every minute of it will be joyous - and duly logged as such. But I still wish I had made myself get just 45 more minutes of creative joy in June. Textual changes across numerous editions of Louise May Alcott's Little Women. My own paper on child poet Hilda Conkling was well received. I caught up with beloved once-a-year conference friends, drank margaritas on the River Walk, scribbled down so many book recommendations, reconnected on such a deep level with a world I love, and even joined in a "Families Belong Together" rally in front of the nearby cathedral. 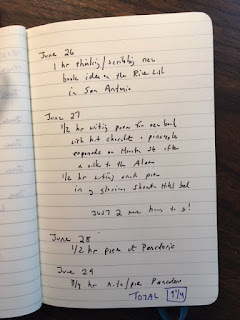 I also walked alone every early morning past the Alamo and found a wonderful bakery/cafe, La Panaderia, where I sipped hot chocolate and nibbled on pineapple empenadas while writing poetry. But. 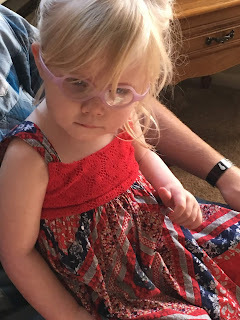 . . it's so hard on my family when I travel now, given health issues and other ways in which I'm needed and will be needed even more in years to come. As I noted in my previous post, conference travel is extremely expensive, too. Partway through the conference I thought: oh, I love this world too much ever to let it go! But by the end, I started to think: these twenty-five years of attending the conference have been blissful, but my life at home is pretty blissful, too. Anywhere that I can drink hot chocolate and write poetry is a blissful place to be. Today at Tiny Town with them I was just as happy as I was last week, immersed in the world of children's literature scholarship. (Not happier, I have to say - but equally happy.) In an ideal world, I guess I'd have both: travel to fascinating academic gatherings all around the country (and the planet!) AND intense family time at home. But few people live ideal lives in an ideal world. It's enough to have a happy life, in whatever form it needs to take. On this Independence Day, I'm remembering that, in the end, independence isn't everything. Pursuing happiness isn't as important as appreciating happiness when you already have it.